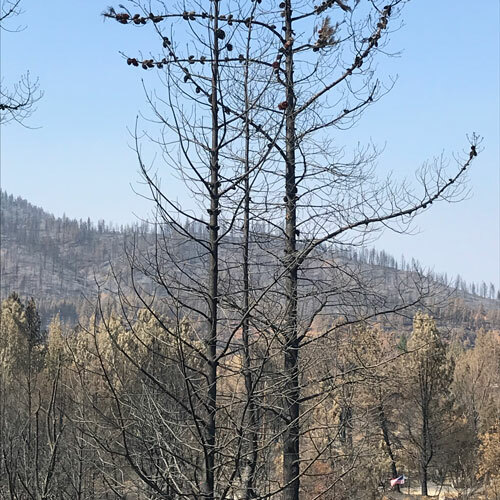 The devastation from the Carr Fire in west Redding was severe, especially in the areas around Old Shasta, Keswick and Rock Creek Road. The severity of the fire can be correlated with the amount and type of fuel, e.g., species and density of trees and brush. The area that burned the hottest were often dominated by Knobcone Pine and Manzanita sp. Lets talk about Knobcone pine for a bit. This pine is a fire dependant species meaning the cones require fire to germinate, and when they get fire, well sprout they do. I recall studies done over 20 years ago, when we were working in Middle Creek Watershed on erosion control and fire prevention. The studies indicated that, historically, the natural wildfire fire intervals in the region was averaging about every 10-15 years. Because of development in the urban interface and modern fire suppression efforts the last big wildfire was over 30 years ago. Meaning the fire was severe because of fire suppression! Also meaning many of the dense stands of knobcone pines occur today because of a wildfire 20-40 years ago, which aided the germination of the cones, ergo the stands of Knobcone Pine that promoted the recent conflagaration were born in the last wildfire. Foresters know one can count the whorls of limbs on conifers to roughly determine the trees age, each whorl is one year. This is a knob cone pine. Counting all the whorls indicate about 35-40 years old, The cones are now ready to start a new fire cycle !! The Knobcone pines on the ridge in back show the “even age” nature. The unburned pines in closer are probably Ponderosa Pines. Many ecologists believe that by planting properly selected (by mimicing the indiginous system) California native grasses (pioneering species) we can “set the stage” for establishing a more natural successional process – grasses succeded by shrubs, followed by oaks and conifers. The ‘do nothing approach’ will likely result in more of the same, Knobcone pines and manzanita. Wherby CA Native grasses, given a leg up (advantage) by adding mycorrhizae fungi and biotic fertilizers, is likely to result in a more natural and less fire prone landscape. Remember also that this landscape has not been “natural” for some time. Anthropogenic (human-caused) land uses, like the smelters at the turn of the century, severely altered the land and denuded the Ponderosa Pine forests that predominated the region historically. Maybe now, after the Carr Fire disaster, we can turn the tables and set the stage for natural succession. We will need to do erosion control anyway, especially in many locations where infrastructure and dwellings will be threatened by potentially severe erosion. So why not select and apply Best Management Practices (BMPs) that include Native Grasses, mycorrhizae fungi, and Slow-release, biotic fertilizers? This is in fact what Caltrans is doing along the 299W highway corridor. I will be sharing the seed mixes and mulches and amendment specifications that are currently the best state-of-the-art. Coming soon!